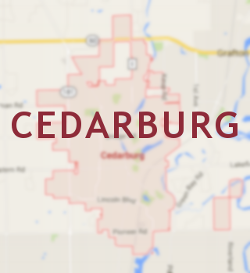 If there’s one location in Wisconsin known for luxurious homes, it’s Cedarburg. Somehow this pocket of homes just north of Milwaukee manages to capture the impossible combination of modern elegance and classical charm. If you’re one of those proud homeowners, we’re equally proud to declare that the best chimney service in Wisconsin is available to residents of Cedarburg. Fireplace repair is a must in Cedarburg, WI for anyone looking to capitalize on our trademark of ensuring safety and restoring luxury. View chimney sweep reviews from REAL customers in Cedarburg! For the toughest procedures like concrete chimney caps and crown repair, our Cedarburg chimney sweeps get it done. Chimney concrete must be beautiful, but beauty is of little to no value if it easily crumbles. To guarantee your new personal luxury lasts, we make chimneys indestructible so they last like the greatest architectural monuments. Every time we schedule a chimney concrete repair appointment in Cedarburg or elsewhere in Southeastern Wisconsin, our technicians consider it an honor to make your home extra beautiful. Do Chimney Doctors Go to Medical School? As chimney sweeps, we often refer to ourselves as chimney doctors for a reason. The complexity of restoring a chimney requires delicate precision, not unlike an operation. Years have been spent by chimney professionals fine-tuning the advanced craft of masonry work. While the practice isn’t medical, mastering chimney concrete is not an easy task. For Cedarburg fireplace repair, we want to make you enormously proud of your home and its flawless chimney. Not ready to schedule an appointment? Contact our Cedarburg Fireplace Repair experts today.